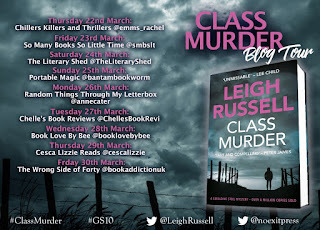 Welcome to my stop on the blog tour for Class Murder by Leigh Russell (an author who has fabulous taste in colours, her favourite colour also happens to be mine, purple!). Geraldine Steel is back for her tenth case. Reunited in York with her former sergeant, Ian Peterson, she discovers that her tendency to bend the rules has consequences. The tables have turned, and now he's the boss. This is the 10th book in the Geraldine Steel series, I have picked some of the previous book sup out of reading order however I advise starting at the beginning. There is so much history that is relevant to this book I think to enhance enjoyment of the book I would definitely go back to the beginning. Geraldine finds herself trying to settle after relocating in York, happy to be reunited with fellow officer Ian Peterson, now her superior, there are mixed emotions. Geraldine's private life has in recent times proven to be challenging, having a knock on effect on her job and she is trying to deal with that, new living arrangements, changes at work and now a vicious killer is on the loose. We open to the killer as a child and flip around in modern day with the police investigation, insights from the killer and the victims. The police need a link, they need a motive and maybe then they can get a break on the case. Some aspects of the book are frustrating from the police point of view and what they come up against with the people they are investigating. I guess that is a true representative of what some of the force come up against in any investigation, let alone one so serious. I said in my review of book 9, the family side of the story really hit me from an emotional stance, this book, whilst is does refer to family, the drive is more on the killer, victims, police investigation side f things. I always mention this with Russell's book but I love the Acronym glossary she uses at the front of a book. How many times do we read acronyms and forget what they mean and you are back tracking on the pages to find what they mean. May not be a big thing to some but I love it. 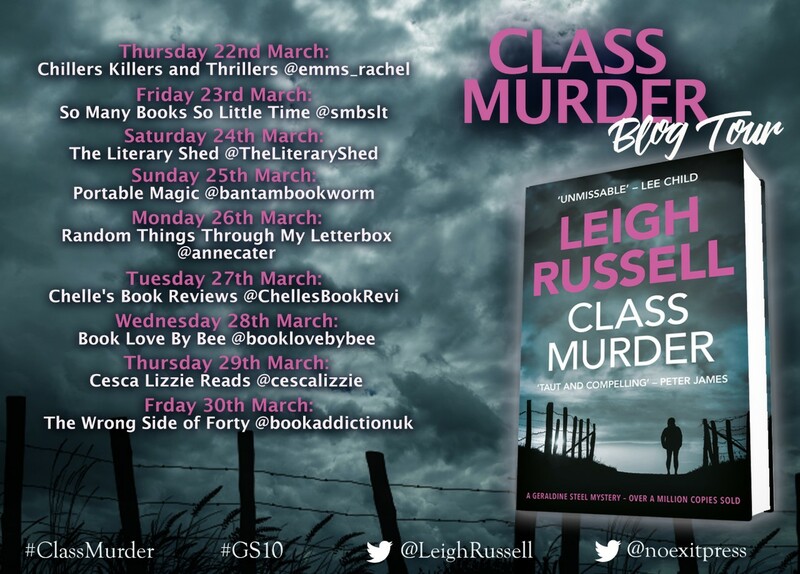 Class murder itself is a riveting story, pulling the reader in from page one, 4/5 stars for me this time. I really need to go back and buy the couple of books I missed from this series! Have read more than a handful of Russell's work I can say, hand on heart, she is going from strength to strength and I cannot wait to read what is next for Geraldine Steel. Labels: 4 stars, Class Murder, crime, D I Geraldine Steel, Ian Peterson, Killer, Leigh Russell, lies, murder, No Exit Press, police investigation, secrets. Sounds like a good series to get into!